« 2016 Cannonball Race Of The Century. Stage 5 Results. Published by Cyril Huze September 16th, 2016	in Customs and Editorial. 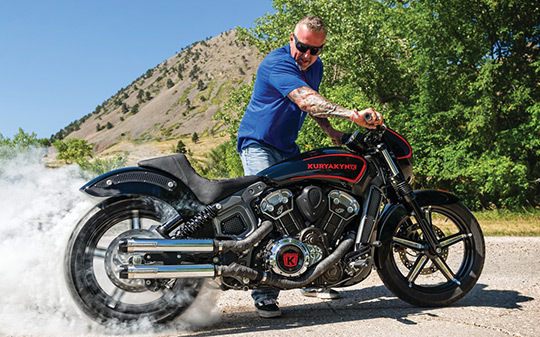 The very successful Indian Scout and Scout Sixty are powerful middleweight cruisers offering platforms begging to be customized for an even more aggressive stance. 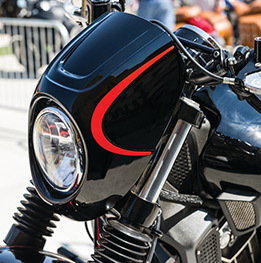 John Shope of Dirty Bird Concepts designed a “Sprint Scout” line of custom parts produced by Kuryakyn and featured on a custom Indian Scout introduced during the last Sturgis rally. 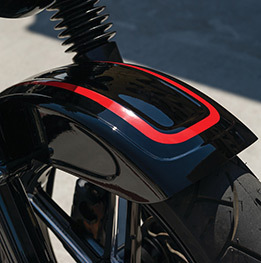 Among these parts, a rear fender chopped and sculpted for a racier look that feeds off the tight lines created by the bolt-on Sprint Front Fender, Café Fairing, and Chin Spoiler. Factory belt and countershaft sprocket covers were cut and modified for a rugged semi-exposed appearance. 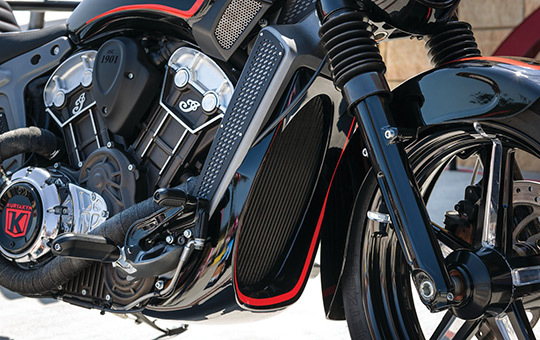 Satin black Kuryakyn Heavy Industry footpegs and mirror, along with a custom engraved derby cover, powder coated factory covers, dirt track-style bars and wrapped head pipes with Crusher Maverick Slip-Ons all contribute to the Sprint Scout’s aggressively styled demeanor. Kuryakyn also incorporated a few prototype parts for the Scout that will soon be in production and available in early 2017. All parts and info at Kuryakyn Shope Signature Series. Applaud the effort but this is a Victory Octane with an ugly engine. Why wouldn’t the consumer stick with the cool engine and put the dollars into custom paint? I like a MotorCycle Engine with cooling fins. Why I dont know ?? !! Thats what I llike,even if there is some liquid cooling why not make use of the air flow. Or is that a much more expensive way to go about it ?? Good luck…..build a bike that will fit taller folk.